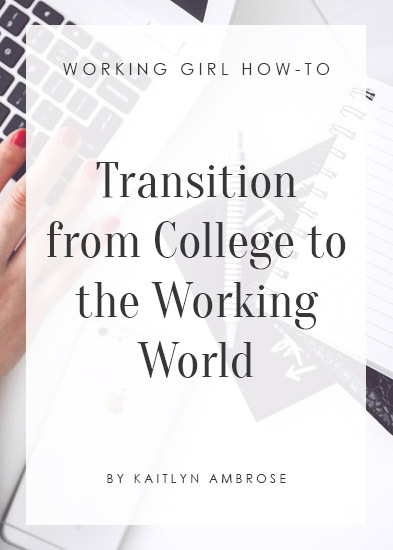 Transitioning from college to a full-time job is a major change for any recent graduate. When I landed my first job, a flood of emotions came after I heard the words, “We’d like to offer you the position.” I was excited, but I was also super nervous. Would I meet their expectations? What’s it going to be like working in an office 40+ hours a week? How am I going to move across the country in eight days?! Sign up for a gym membership or join a yoga studio. Becoming a member of a yoga studio or gym is not only a great way to get some quality stress-relief time in, but it’s a perfect opportunity to make friends. If you’re like me and moved across the country for a job in a city where you know no one, this could be a game-changer. Stay in touch with your alumni network. If you find that you’re really missing your college days, keep in touch with your alumni network. Subscribe to the alumni newsletter, follow the official Twitter account, or offer to speak during a meeting of an organization you were involved in. This way, you’ll remain connected to your alma mater. Put yourself out there. I know this is a lot easier said than done, but it’s important to be open to new opportunities and experiences. Think back to your freshman year and how new everything was. Well, the same goes for life after college! Don’t be afraid to ask your boss to grab a cup of coffee or volunteer for that organization you love. You’ll be glad you did. What are your best tips for transitioning to your new and exciting work life after school? Leave your thoughts in the comments below or tweet us at @HeyWorkingGirl!